Home > French Blog > French Vocabulary > Next Thursday: ce jeudi, jeudi prochain, jeudi en huit ? Translating something as easy as “next Thursday” can turn to a nightmare in French. 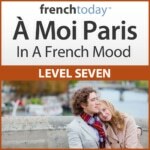 Learn the different French expressions to express the notion of next + date in French, and find out the least confusing way to make plans in French! Before starting this lesson, I suggest you first review how to say the date in French. We have may expressions in French to refer to an event… And some are confusing to foreigners and the French alike!! This one is pretty straightforward. Next week is not this week, it’s the one after the current one. Cette semaine je suis à Paris, et la semaine prochaine je serai à Nice. This week I’m in Paris, and next week I’ll be in Nice. Notice how “prochaine” has changed place. Now, with “prochaine” before “semaine”, you are saying ‘the following week’. This is used mostly in indirect speech, not during a live dialogue but when you are retelling a story to someone. L’année dernière, je suis allée en France. La première semaine, je suis allée à Paris, et la prochaine semaine (or you could say “la semaine d’après”, or “la semaine suivante”) je suis allée à Nice. Last year I went to France. The first week I went to Paris, and the following week I went to Nice. No problem there either. You are clearly talking about the Thursday of next week. No matter what day of the week it is now. That’s where the troubles begin! Let’s say today is Monday and you want to make plans with your friends this coming Thursday – Thursday of this very week. “ce jeudi” = this Thursday (so coming up). “jeudi de cette semaine” = Thursday of this week, not problem there either. Now let’s change the date: let’s say that today is Friday… If you said “ce jeudi”, or “jeudi de cette semaine”, you’d be referring to a PAST event: actually, the day before since today is Friday… Subtle, right? Ce jeudi, je suis allée à Paris = past tense, therefore, talking about a past event. Ce jeudi, je vais aller à Paris = near future, therefore, talking about the Thursday coming up. 6 – Jeudi prochain = next Thursday… or this coming Thursday… Confusing to the French too! And the problem worsen with “jeudi prochain”. Some people interpret it as “le prochain jeudi” : so the Thursday coming up. Others interpret it as “le jeudi de la semaine prochaine”: so Thursday of next week. “Jeudi prochain”: could mean the next Thursday coming up, or Thursday next week, which in this case is the same date. French language forums go on and on about it! It’s hilarious! And everyone is convinced their way is the only possible way, and try to prove why it is logical. This is an old-fashioned expression, but many people still use it. Eight days from now, including today, so seven plus one for today… really, in a week. It kind of makes sense if the day you are saying “Jeudi en huit” is a Thursday. Then, it’s kind of clear, it’s Thursday in a week… So next Thursday. J’ai rendez-vous chez le docteur jeudi en huit. I have a doctor’s appointment Thursday in a week. So let’s say today is Monday, and they say: “Jeudi en huit, je vais aller au cinéma”. What does that mean exactly? 4 + 7 or 8 days from now? Or the Thursday coming up this week? I won’t even start debating the maths there… especially if you are using this expression on another day than a Thursday!! Another very common expression in French is “dans quinze jours”. This also means two weeks… More or less !! So it’s common to use a very precise number: fifteen, but to actually mean anything between… ten to ? Eighteen ? Dans quinze jours, je pars en vacances: in two weeks (more or less), I’m going on vacation. The assumption in this context is that, for most people, your work week will end on a Friday afternoon so that’s when your vacations will start. the date number : “tu veux dire jeudi 12 ?” = you mean Thursday the 12th? or ask for a clarification: “tu veux dire ce jeudi-ci : jeudi qui arrive, ou jeudi de la semaine prochaine ?” = you mean this Thursday: this coming Thursday, or Thursday next week? And don’t feel bad you didn’t get it the first time around! As I said this is confusing even to the French! 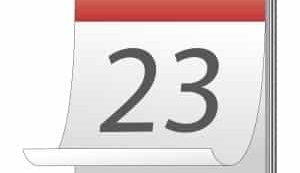 How to Say the Date in French – Le or no Le ?